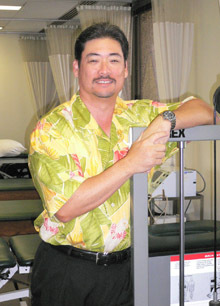 Orthopedic Rehabilitation Specialists, Inc. (ORS) is a physical therapist owned and operated private practice in Honolulu, HI which was established in 1990. The physical therapists at ORS are dedicated to assisting individuals in achieving their maximum level of function regardless of the complexity of their injury. To achieve these goals we provide exceptional 1-1 physical therapy services customized for your specific problem and needs. Our programs are patient centered focusing on manual therapy, education and patient participation. We focus on providing the right intervention at the right time to achieve your goals. You can rest assured that you will be receive timely and competent care for your condition. Your first visit will consist of a comprehensive and through evaluation and assessment of your condition. You can expect a detailed explanation of your problem areas and a discussion regarding your treatment alternatives. Depending on the time available after the evaluation, we try to commence treatment on the same day. In order to provide to you the best possible service we ask that you be on time for your appointnments. Please feel free to contact our clinic at 808-979-0700 with any questions. We look forward to seeing you. Located on the sixth floor of the Pan Am Building, at the corner of Kapiolani Boulevard and Kaheka Street. Validated parking is available in our parking structure off Makaloa Street.